What a yummy idea! That’s one we’ll be trying really soon. 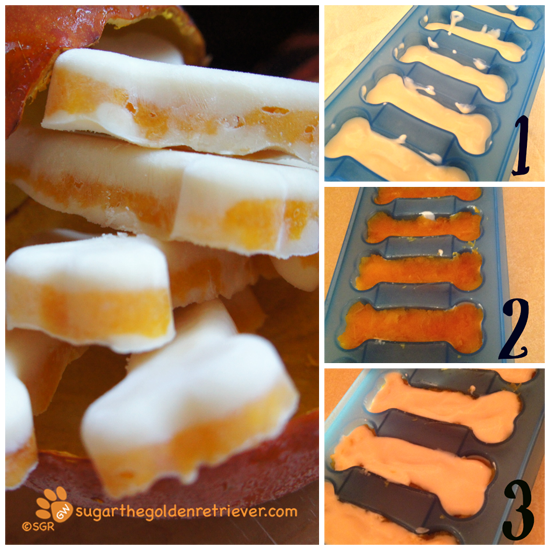 We need to get some of those special bone-shaped ice cube trays. We’ll be googling tonight. We’re glad the tsunami wasn’t what they expected. We were worried about you. Wow….that’s very creative! And sounds delish! Ooooh, those look SO GOOD! I’m definitely going to make Momma try this one. We have a pumpkin to roast once Howl-o-ween is over with. Oh Sugar today’s treats made Mom’s mouth water. She said it reminds her of a Dreamsicle from her youth. Vanilla ice cream on the outside w orange sherbet inside…so refreshing in the hot summer. 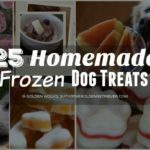 Awesome treats! 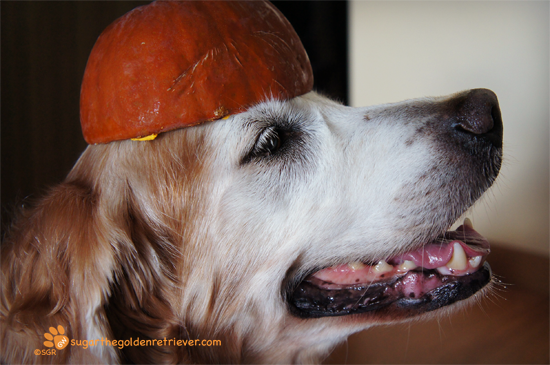 Love your pumpkin hat! Your mom never forgets about you. Those really look good too. Enjoy. Those look amazing! Your hat looks fun too! 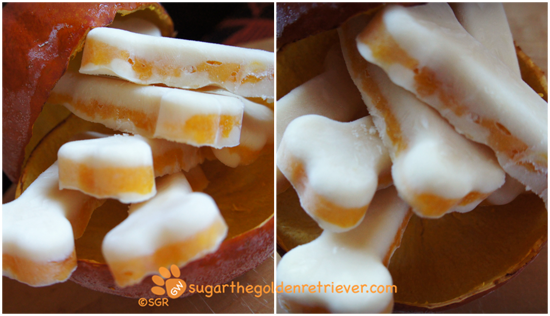 Oh my goodness, I think this might be one of my favorite treats you have featured. I am all in a drool puddle. And the pumpkin looks pretty cute on your head. Love the pumpkin helmet hat and the treats sound yummy. I will speak to my Mom about making these tasty treats right away. Those look yummy Sugar! You even look cute with a pumpkin on your head! Aloha! Looks AMAZING! 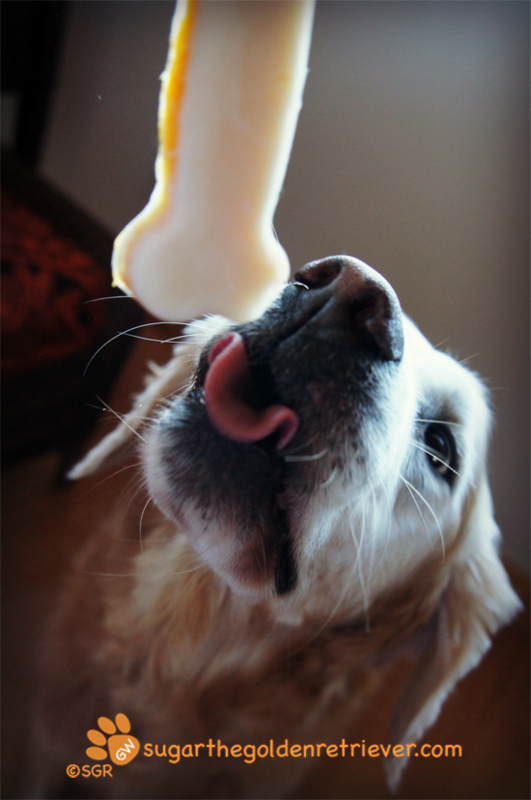 And I love your bone shaped tray! Wow we love those Sugar. Brillianrt. Hope you enjoy eating them all. Have a lovely Tuesday,. Sugar, I think this would be a great summer treat but right now it is cold here and frozen treats don’t sound as good. Thanks for sharing the recipe though. Enjoy your sunshine! Mom says those look adorable! I say they look delish!!! What a great idea! Where DO you get those molds??? They are fantastic! I’ll have to try some for us – that sounds tasty! We love your hat, Sugar!